Phil's laid out on the floor, Stu's sporting a Tyson tat on his face, Alan's shaved his head and there's a monkey in a denim vest--it can only be the poster for "The Hangover Part II." And much like the poster for the first film, Doug gets the shaft. The arrival of the poster is a pretty fair indication that we'll be seeing a proper trailer in the next 48 hours. A teaser clip dropped a few weeks ago, but it really was just a teaser. It's kind of funny and sad, but "The Hangover" launched the careers of Zach Galifianakis, Bradley Cooper and Ed Helms to a new level, while Justin Bartha got left on the roof, baking under a hot sun, so to speak. Bartha's a likable and talented guy, but his role was a human MacGuffin in the first film, and judging from the poster he's little more than an also-ran in the second. But hey, as long as "Hangover II" is at least half as funny as its predecessor, we'll let Bartha worry about himself. 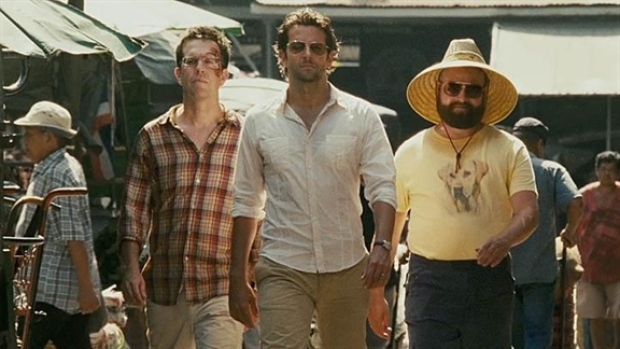 "The Hangover Part II" arrives Memorial Day.